I've already talked about some of the cocktails, beer and bar snacks that can be found in Fiji. But such things are mainly for tourists. You haven't experienced the real Fiji until you get down on a hand-woven coconut mat on the floor and drink kava with the locals. Kava is made from the dried ground roots of the kava plant, a Pacific relative of the pepper plant. The root powder is put in to a small bag that is thoroughly kneaded and squeezed in to water as Ratu is doing in the picture above. The result is a muddy-looking liquid. At Navutu Stars they use a traditional-style hand-carved tanoa (bowl) from which to serve the drink to guests. However, if you travel more extensively through Fiji you might find you are sometimes offered Kava from a far less grand receptacle, like a plastic bucket or a weathered washing up bowl. I don't think this makes any difference to the taste. 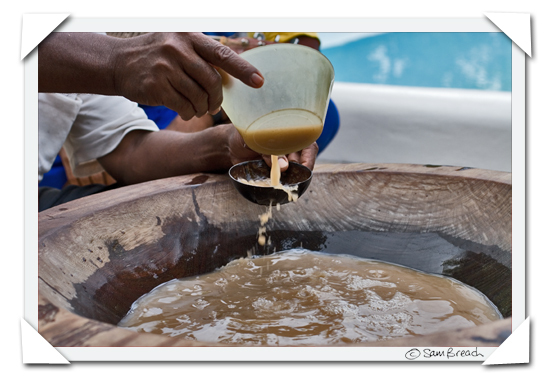 Although Kava is drunk throughout the islands of Fiji, its main production takes place on the mainland of Fiji, Viti Levu from where the roots can be purchased. The Kava is transferred from the tanoa (ceremonial bowl) to the bilo (coconut shell). During a Kava ceremony, the tradition is to sit on the floor with your legs crossed. When you are handed a coconut shell full of the drink, you should first clap and say "Bula" before accepting the cup and drinking all of its contents quickly, down in one. As you hand back the empty cup you clap three times and everyone else joins in. 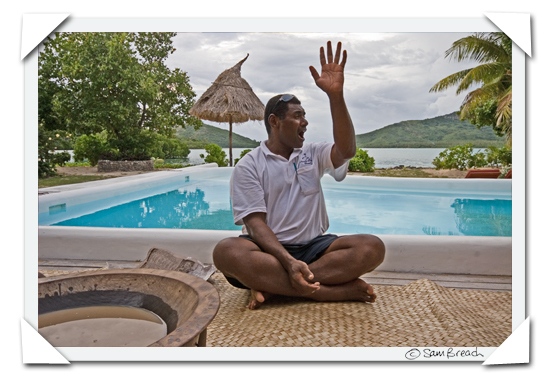 The word "Bula" described by one traveller as "one fourth of everything that comes out of a Fijian's mouth" actually means "health" or "life" but in practice is used as a greeting too. What I have described is a relaxed version of the ceremony which should get you by in casual, social situations. If you are required to attend a more formal ceremony you will need to brush up your knowledge on local protocols and pecking orders. True to its apearance, Kava actually tastes like you might imagine muddy water would taste. The drink has a mildly numbing effect on the teeth and the tongue but otherwise it had no noticeable effects on us. According to some sources, it is meant to make you feel relaxed, de-stressed and sleepy, but since for me that just about sums up the whole Fiji effect it's hard to tell. It doesn't bother me in the slightest, but some people are apparently not keen on communal sharing of a drinking cup because of hygiene issues. If you are a germaphobe, you had better stay away from the Kava! And do we like it? Erhm? Well, put it this way - we came home from a previous trip to Fiji with a huge stash of dried Kava root and big plans for throwing a Fiji party. Almost two and a half years later the Kava is still sitting in our fridge untouched and no such party has ever materialized. But when in Fiji - I can't get enough of the Kava ceremony. Any personal opinions of this drink aside, the chance to sit with a warm, friendly group of Fijian people and share such an important and historic part of their culture with them is always an honour. ?Have you ever tried Kava - and if so would you ever try it again? I have heard you can buy Kava root at Rainbow Grocery but haven't confirmed this. Ok, I lied on my earlier comment saying I was too young to drink when I was in Fiji last - my parents DID let us have some of the Kava. I remember liking it but probably because I knew it was a bit "forbidden" - we drank it out of coconut shells. Thanks for making me remember! I guess if I was ever lucky enough to visit Fiji I would try it~ but the muddy water look is rather off putting!! something enidd has never tried. she'd like to. never had it, would love to try it. guess i've just *got* to go to fiji, huh? Great post about kava. I had a friend who was in Fiji in the peac corps and she was always raving about how it was so relaxing, but I haven't tried it myself. I'd be curious and would try it if I had a chance though. I've enjoyed kava many times. My brother lives on the Big Island, HI. The local kava bar is just a short walk from his home. 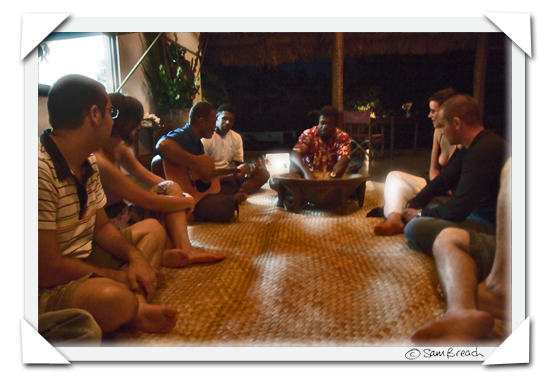 Many a fun nights were spent drinking kava and "talking story" with the locals. We had Kava several times during our visit to Fiji in 1999. Can't say I really liked the taste. One word of warning is to ensure they make it with purified water - something we learned the hard way at a Kava ceremony in a remote village. You've probably read "Getting Stoned with Savages" by Marten Troost but, if not, it's wonderfully funny and he talks a lot about kava in the book! Very well written, too. Yes, I had it in Fiji. It made my tongue numb and it tasted like dirty ears. No, I would not drink it again!! I tried it at the kava bar on the Big Island as well. I gave it the old college try, but just came away feeling a bit ill. Oh well. My last year in the city, (Seattle) I found myself drinking it almost every night before bed to relax. I put two teaspoons of powder from the herb shop into a mug of hot 1/2 coconut cream and 1/2 pineapple juice. It totally became a ritual without me even noticing. Next thing I knew, (after a year had passed), I found myself packing up my city life for a permanent move to Hawaii, where I had family. Just could not handle the city anymore. So, yep, I'd say it is powerfully relaxing stuff! 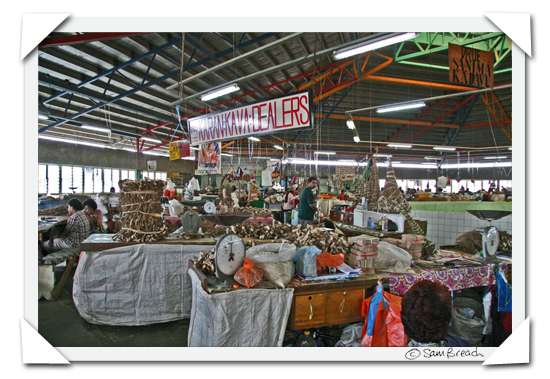 You can buy Kava as a homeopathic remedy in most health food stores. It's in liquid form and does have a relaxing effect but it doesn't taste very good taken straight. I like it in tea which I sweeten with Stevia and a bit of milk but YMMV. On a working trip in Fiji some years ago I earned the prize for the most kava drunk. I had a sore throat and it helped relieve it. My best kava expereince happened late at night when a group of us were invited by a worker at the resort to his village for a kava ceremoney. In the dark we trekked through the bush to his village, where he woke the elders up and they made kava while he played guitar and sang Fijian war songs. It's quite interesting to watch it being made. After many bottles of wine preceeding the event we weren't the least concerned about germs. I tried it least year at a Kava bar in Ft. Lauderdale, and I would have it again! I was with a friend who grew up in Hawaii, and she regaled me with tales of chewing kava root as a kid in order to soothe dental pain. I did learn that a)you shouldn't drink on the beach, because sand between your teeth feels nasty; b)don't order a quadruple shot and hope to share it with your friends, because they may be wusses; and c)having some fresh pineapple to wash it down with is a wonderful thing. 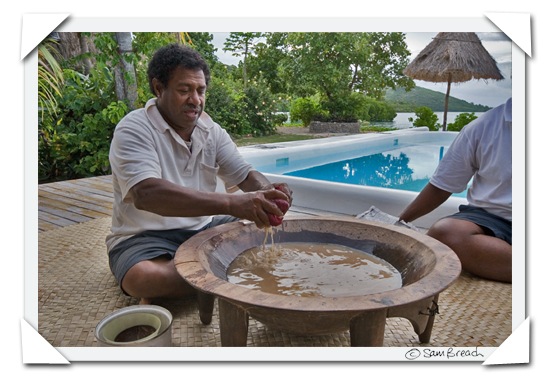 I visited Fiji in 2004 and have tried Kava. To be honest, it just tasted like water with a little dirt in it. It makes your mouth all numb for a while. They use rain water to mix the root so make sure you know where the water is coming from. If you're trying it for the first time, ask for a "low tide" so you don;t have to drink a whole bunch in case you don't like it. Yes, I've had kava and would jump at every chance. The enjoyment mostly comes from sitting around and talking story for hours on end while the kava bowl goes down. They say that kava makes people more social but without making them more stupid (unlike alcohol). It's also apparently pretty important not to partake of kava and alcohol at the same time. The combo is hard on your liver or something. Yep, had so many bowls of the stuff while recently in Fiji that I'm sure my bladder and everything else inside was quite relaxed. I went into a village in Viti Levu. Befriended several of the villagers who sold the stuff behind the markets during the day. There was one day were I almost had about 20 coconut shells of the grog. In one sitting if I have more than 5, I can get half-intoxicated. But then, I'm not a big drinker though. Hi Sam i was wandering if i might be ablt to use the photos of the kava bowl and preparation to sell kava on ebay? Thanks look forward to a response. kava was being said to be the drink of the gods. In the olden days kava is normally being drank by men only also men with high status in the community/village, different Pacific countries have different ways of drinking kava . In Vanuatu it is normal for the chief/ elderly who is present in the nakamal to drink first his shell of kava before the rest. It is a tradition to do a circle their heads around the kava and chant some specific lines asking the gods of the kava to bless the kava and also to make the effect work. After that the kava is being drank and it is tradition to spit. Kava is a very relaxing drink, it is the equivillent of overseas (US, Aussie, England) friends going to a pub after work and drinking beer, in the islands (Vanuatu) people go to the kava bars (Nakamals) socialise and drink kava.